Saint Augustine’s conversion was, in some way, a conversion to religious life. A couple of years previous to the garden scene in Milan, provided that the scene is historic, Augustine was already a believer. He believed in God, in His spirituality, in Christ, the Way, the Truth and the Life. He believed “in the soul’s spirituality and her capacity as God’s image, and in the Church’s authority representing the true religion” (1). It was not, therefore, the intellectual doubt that gripped his soul, nor the demanding Christian morality. Fourteen years faithful to a woman was a good guarantee that he would not find too difficult to carry out an honest married life. Moreover, Augustine had already taken some steps along the path of generosity. Now he was fighting on another front that we might call the ascetic front. Drawing by Rafael Nieto. Marcilla, Navarra (Spain). In the spring of 385 Augustine was 31 years old and a distinguished professor of Rhetoric in the imperial school of Milan; he was at a reach point of wealth ands glory. But he was not a happy man. Neo-Platonist philosophers had shown him the limits of earthly hopes, and the Bible had kindled in his heart the love of perfect chastity. But the tyranny of routine and costume chained his power of will to embrace abstinence, and he was running to find wisdom. Under those circumstances, Ponticianus, his compatriot and “a Christian man of long and frequent prayer”, came along to visit him. Ponticianus told him of the life of Saint Anthony Abbot. Saint Augustine had never heard about him. Ponticianus also told him about the group of monks who lived in the deserts of Egypt. A few men from the court of Treveris have just left their girlfriends to the carry out the monastic life. The story moved his soul, setting off a storm that struck his cowardice, freed him from slavery to the flesh and led him to a final victory. “What is happening to us? What do you hear? Ignorant people raise up and steal heavens from us, and we, with all our knowledge, lacking in heart, wallow in flesh and blood! Is it perhaps because we are ashamed to follow them and we do not blush to be left behind?” (Confviii,19). The battle was not finished yet, but the feeling of its outcome was already decided. The child’s voice that brought him back the memory of Anthony the Abbot and words of the Apostle (Rom 13, 13-14), ripped the last bonds of flesh and led him to the embrace of continence. Henceforth Augustine Would never be an ordinary Christian. The fight had renewed him and left him “desiring no woman nor hope in this world” (Confviii, 12, 30). He had given up wealth already 13 years ago. He came out from the battle an ascetic man, a Christian philosopher, and perhaps unconsciously, a monk: monastic life had shown him the concrete way to devote himself to ancient wisdom in the company of a group of friends. From then on until his death, Augustine lived always in contact, more or less conscious and intense, with monasticism. Nevertheless, the world of culture marginalizes with routine this essential aspect of his personality. Following in the footsteps of Erasmus, they forget the monk and prefer to concentrate their attention on Augustine as a Bishop and as a wise polemicist man. Their position may seem reasonable, but they forget that Augustine was a monk by choice, whereas he accidentally became a Priest, Bishop and polemicist by the circumstances. His love for religious life was so deep that he never wanted to give it up. His mind was so sharpened to find ways to reconcile it with his pastoral duties, and that made him one of the biggest innovators. With his life, writings and disciples helped free the old monastic and pelagian ante litteram overvaluation, asceticism, an many extravagances, and became closer to the occidental mentality that opened to him unthinkable horizons. 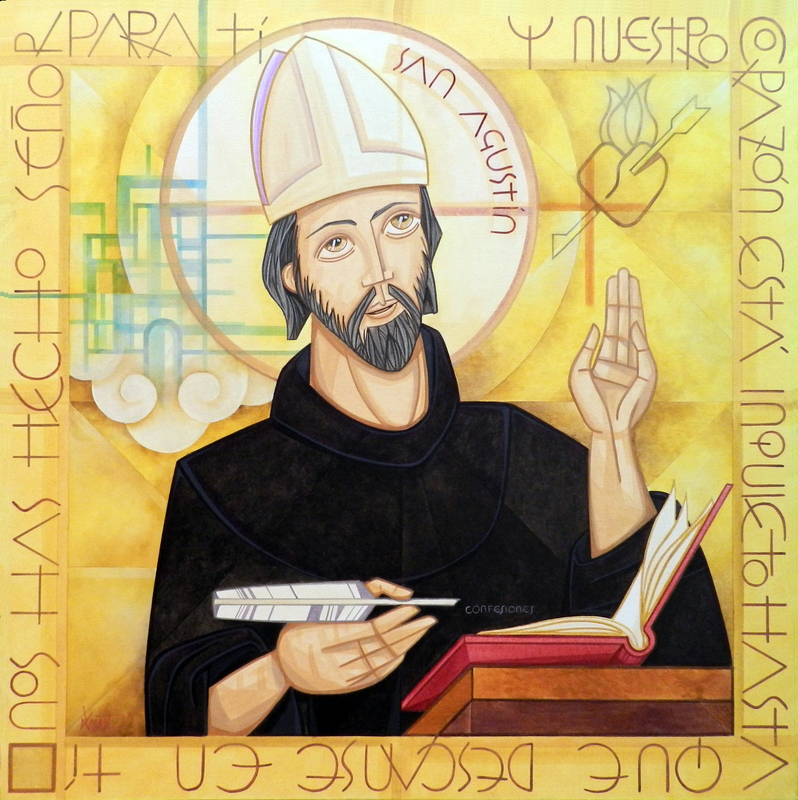 No one as Saint Augustine has contributed to free monastic life from the dangers of self-absorption, and no one as him has opened the doors to the priesthood, the pastoral care, the Missions and the culture (2). Saint Augustine. Jaime Dominguez, México. — The first four paragraphs are based on Saint Augustine’s writing about monastic life, and on the investigations of T. van Bavel (1959), A. Manrique (1959, 1964), J. Gavigan (1962), Luc Verheijen (1967, 1980 and 1988) and A. Zumkeller (1968). I have also used writings from Brown (1967) and Mandouze (1968) and some other investigations by Monçeaux (1931), Folliet (1961), Sanchís (1958), 1962), R. Lorenz (1966), Cilleruelo (1966), Trapé (1971), Lawless (1987) and some other authors. — The last paragraph: Dickinson (1950), Dereine (1953), Vilanova (1959, 1983), Siegwart (1962, 1965), La Vita Comune (1962), Fonseca (1970), De Vogüé (1972, 1983), Villegas (1974), Villegas-De Vogüé (1976), De Seilhac (1974), Mundó (1982), Linage Conde (1982), Grégoire (1982), Milis )1979, 1980), Martínez Cuesta (1987) and Chatillon (1992). — Victorino Capánaga, Agustín de Hipona, maestro de la conversión cristiana, Madrid (bac maior 9) 1974, 43. (2) Basil Steidle, Die Regel Hl. Benedikts, Beuron 1952, 20-21.